We're not happy unless we're keeping you up-to-date on sell-out products—mainly so you don't miss out on an incredible piece of clothing. Today, it's the turn of the plus-size suits from River Island. 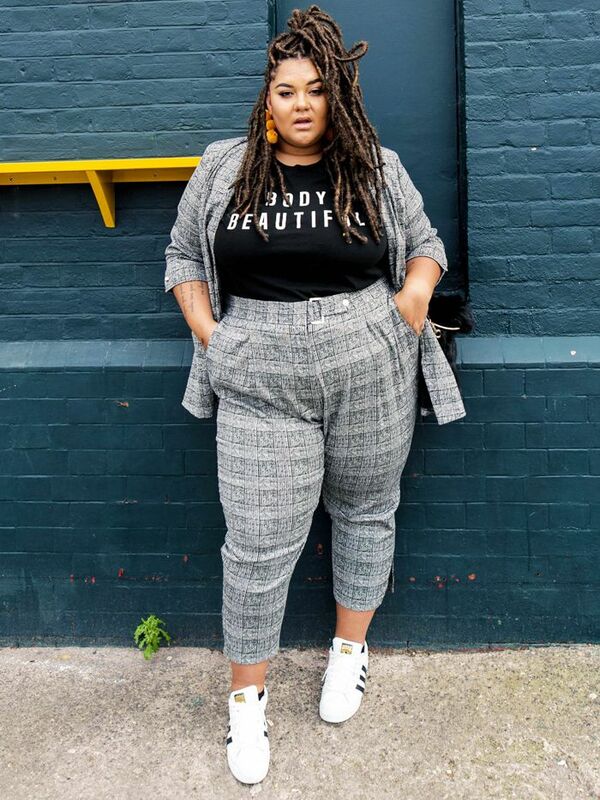 Our insider at the brand told us that the range of two-pieces for sizes 18 and up have been "flying off the shelves" with plenty of Instagram stars posting up stylish snaps wearing them. Now, while there are a few in the range, most of them have unfortunately sold out. However, they are restocked monthly, and there is a grey checked version (our favourite, as it turns out) that is still available. Keep scrolling to see how Instagram stars are styling theirs, and shop the piece before it sells out. Style Notes: You can't ever go wrong with a suit and classic Adidas sneakers. Style Notes: Make any suit feel glamorous by adding a pair of oversized earrings. You can always wear this by itself. Just tuck in a white tee and wear with black boots for a night out. Next up, the biggest A/W 17 fashion trends you need to know.